We are now in the last posts (for a while at least) that will have any connection with Lismore Castle. But I could not leave without mentioning a couple of plants that I saw there that I have either fond memories of or that I really like. 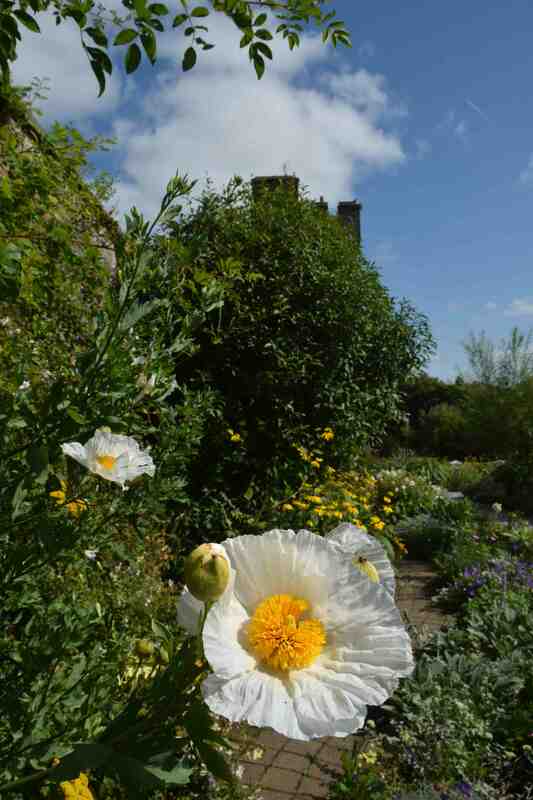 So today we have Romneya coulteri, a giant ‘tree poppy’ from California and the Baja peninsula. This magnificent plant has an Irish connection because it is named after Thomas Coulter (1793-1843) who was a physician and botanist who travelled to Mexico, California and Arizona and founded the herbarium at Trinity College, Dublin. Romneya is a marvellous plant with attractive, grey, slashed leaves up the stems and great white blooms like frilly fried eggs waving the in breeze 1-5 to 2m above the ground. It is a plant that loves warmth, sun and well drained soil and although it is called ‘tree poppy’ it doesn’t have much woody growth in our climate, though the base of the plant can be woody. It is cut back to near ground level by frost and later by tidy gardeners. Anyone who sees it falls under its spell but this is a plant with territorial ambitions that would be the envy of Alexander the Great. Like many plants that spread like wildfire it can be slow to establish at first but once it decides it likes you it does everything in its power to make sure you will never eradicate it. I have seen it grow into walls of old houses where there were poor foundations and sprout through window frames. It will rarely stay where it is put and will send up shoots a metre or more from the original. This may be perfectly acceptable in a wild planting of big, sunloving plants but if you think it would look nice among some dainty echinaceas in a narrow bed you would be advised to consider something a bit more refined. I adore it, but it remains to be seen if I still do in 10 years! I’ve seen it growing wild at the roadside just south of SanFrancisco. Finally I have got one going on my third attempt – near those Jane Phillips Iris, you photographed – but at back of bed. I’m thrilled as at 20€ a pop it was my last time! It’s now in its second year but not more than 3′ H yet. If I can bring it through the winters, it will have lots of room to spread in the long term. I hear it is quite difficult to propagate successfully from those runners. Any tips? When & if I get runners would spring be the optimum time to pot up a runner? I have never been clear as to the growing conditions it likes other than sunny & well drained. I have an idea that it might like a fair bit of moisture too as it grew wild in ditches where there may have been runoff from the roads??? Have you grown it? Yes I think spring would be the best time but I would let it get its feet down and get established first. I have grown it and only in well drained soil.